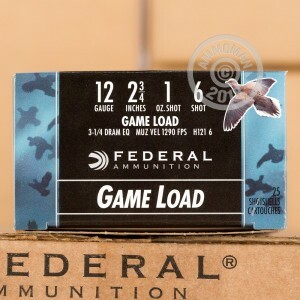 Federal’s Game-Shok shotgun ammunition is carefully crafted and packed with features that provide effective performance on a great variety of upland game. This 12 Gauge shell features a brass plated steel head and one-piece wad which work in conjunction to maximize payloads. Its select propellant and non-corrosive primer deliver efficient and reliable ignition, and its sturdy plastic hull will endure any normal abuse which it is subjected to and may be reloaded multiple times. 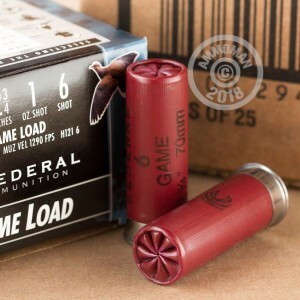 This shell is loaded with one ounce of #6 lead shot that is formulated for optimum hardness to improve its pattern efficiency. The .11” diameter pellets are the perfect size for taking dove, grouse, pheasant, and even turkey with a well placed shot. 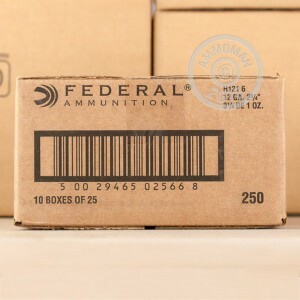 Their approximately 12” kill zone at ranges around 35 yards is remarkably effective against a wide variety of game, so 250 of these handy shells will serve you well for a variety of applications.